The ascending colon is the part of the colon located between the cecum and the transverse colon. The ascending colon is smaller in calibre than the cecum from where it starts. 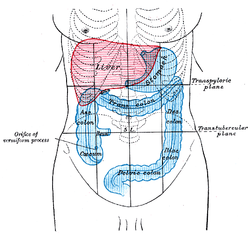 It passes upward, opposite the colic valve, to the under surface of the right lobe of the liver, on the right of the gall-bladder, where it is lodged in a shallow depression, the colic impression; here it bends abruptly forward and to the left, forming the right colic flexure (hepatic) where it becomes the transverse colon. It is retained in contact with the posterior wall of the abdomen by the peritoneum, which covers its anterior surface and sides, its posterior surface being connected by loose areolar tissue with the iliacus, quadratus lumborum, aponeurotic origin of transversus abdominis, and with the front of the lower and lateral part of the right kidney. Sometimes the peritoneum completely invests it and forms a distinct but narrow mesocolon. It is in relation, in front, with the convolutions of the ileum and the abdominal walls. Parasympathetic innervation to the ascending colon is supplied by the vagus nerve. Sympathetic innervation is supplied by the thoracic splanchnic nerves. Inner diameters of different sections of the large intestine, with ascending colon (at left) measuring on average 6.6 cm (range 6.0-7.0 cm). 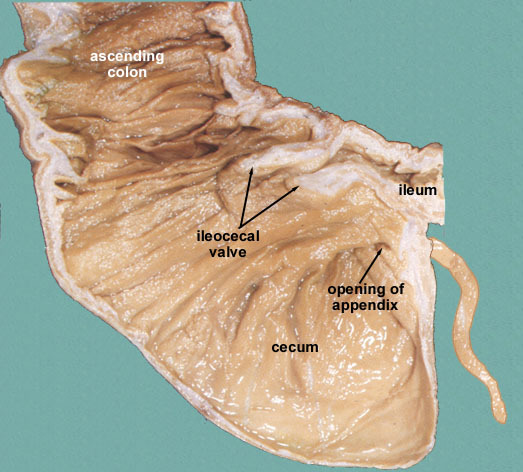 Interior of the cecum and the lower end of ascending colon, showing colic valve. Mesenteric relation of intestines. Deep dissection. Anterior view. Anatomy figure: 37:06-08 at Human Anatomy Online, SUNY Downstate Medical Center - "The large intestine."